Last July, recreational boat sales roared off to double-digit gains as the industry recouped sales lost to a wet and chilly spring. July sales this year lagged 2013’s blistering performance, but builders and dealers achieved moderate gains as the industry continued to recover from the effects of bitterly cold early spring weather that appeared to discourage buyers. Sales in the main powerboat segments rose 3 percent, or 363 boats, to 12,450, and they climbed 8 percent industrywide, or 1,734 boats, to 23,402 in 31 early-reporting states that represent 68 percent of the U.S. market, Statistical Surveys reported today. The results for the month mirror those for the year through July in those 31 states. Sales in the main segments are up 3.6 percent, or 3,206 boats, to 91,572, and they are 8.2 percent higher industrywide, or 11,276 boats, at 148,174. A year earlier, sales in the main segments rose 18 percent and industrywide sales gained 12.9 percent. Ryan Kloppe, Statistical Surveys’ national marine sales manager, said July results this year suffered by comparison. Kloppe said he expects sales to continue to rise in August. “I don’t think we’ll be seeing a lot of double-digit gains in the categories, but there should continue to be slow, moderate growth,” he said. 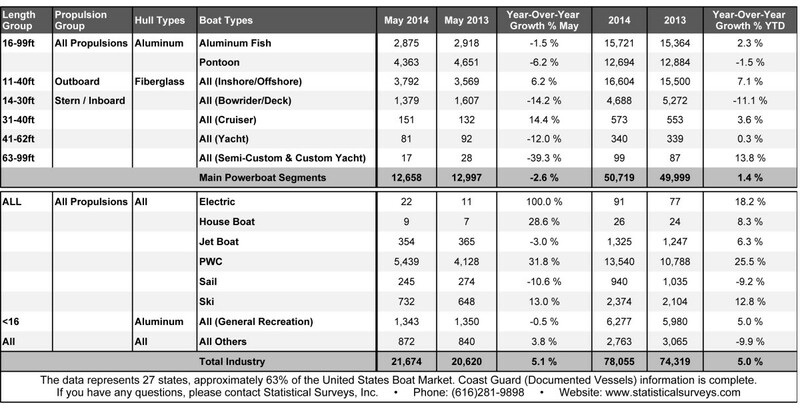 The industry’s main drivers since the recession — aluminum fishing boats and pontoons, and 11- to 40-foot fiberglass outboard boats — continued to advance in July. Sales of the fishing boats rose 3.7 percent, or 99 boats, to 2,772, sales of pontoons gained 5.3 percent, or 218 boats, to 4,330, and fiberglass outboard sales climbed 6.6 percent, or 233 boats, to 3,781. The 14-to 30-foot sterndrive and inboard fiberglass category was the only high-volume group in the main segments that showed a sales decline in July. Sales fell by 198 boats, or 12.8 percent, to 1,352. More boats were sold in seven of the top 10-selling states in July this year than in the same month last year. Kloppe said sales grew 35 percent in Tennessee, 28 percent in Florida and 25 percent in California. Florida was the sales leader with 3,115, a gain of 682, Texas ranked second, with 3,072, a gain of 112, and Michigan was third with 2,223, an increase of 120. Sales were lower in Minnesota (1,314, a drop of 246) and New York (1,297, a decline of 85), but higher in California (1,253, a gain of 253) and North Carolina (1,134, an increase of 176. Rounding out the top 10, sales were lower in South Carolina (967, down 90), but higher in Tennessee (820, up 205) and Ohio (808, up 27). The Coast Guard was up to date in its reports of documented vessels, providing a complete picture of sales in the low-volume bigger-boat categories. Sales of 31- to 40-foot cruisers rose by 16, to 127, sales of 41- to 62-foot yachts fell by 11, to 61, and sales of 63- to 99-foot yachts rose by six, to 27. Among smaller vessels, sales of personal watercraft climbed 15.4 percent, or 1,004 units, to 7,535, sales of jetboats rose by 21.5 percent, or 78, to 440, and ski-boat sales climbed by 54, or 7.6 percent, to 769. Kloppe said the ski-boat segment has benefited as builders design and produce more multipurpose boats. “They’re continuing to innovate their products to have fun on the water,” he said. Sailboat sales fell by 18, or 6.7 percent, to 251.